Already??? I can not believe I'm writing about back to school, even though it's been on my mind since I locked my classroom door June 8th. 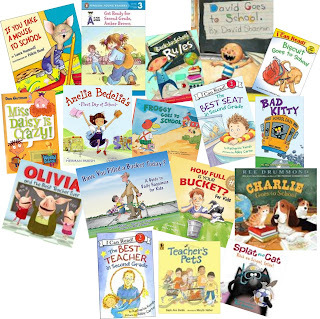 We return on August 14th, and the girls at Collaboration Cuties have spoken, so I guess it really is time to decide which of my PILE of back to school books is my one and only favorite. Man, every Sunday I struggle to pick just one...I know the first book I read every single year is Chrysanthemum, but is it my favorite? Lemme tell you what we do while I think about that. 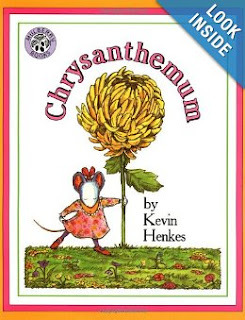 I read Chrysanthemum, which some of my students already know and begin to whine because I'm going to read them a book they've heard before...GASP! Reread a favorite book? Um, yep! 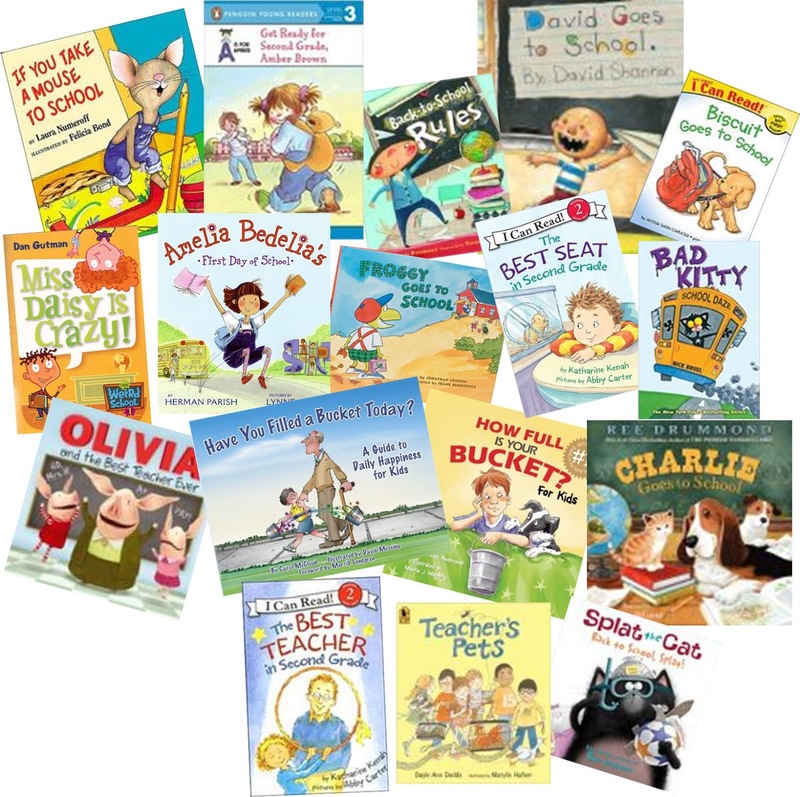 What they don't know is that whenever I read, I use character voices, and because the characters in this book just happen to be mice, well, my Miss Mouse voice comes out, and it's very high and very squeaky, and the kids are instantly engaged even if they've heard the story before (oh my!). This is usually the first time we've sat on the rug in my classroom, and I go over the expectations for rug behavior, including how to listen, before I start. 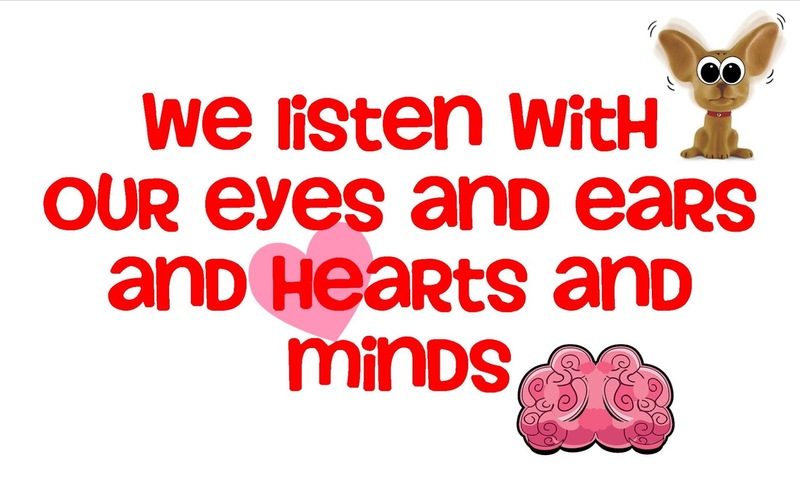 I LOVE this quote, but have no idea whose it is, "We listen with our eyes and ears and hearts and minds." I have a poster that illustrates it perfectly, too. After reading, we each talk about our own names. I get the ball rolling, because I have a slightly embarrassing, somewhat funny story or two about my name. First, my first name isn't Brooke, it's Sherron (that's pronounced (share-en), pardon the limited phonemic coding capabilities of my computer, but I think you get it). My parents spelled it that way because the in South, Sharon is often pronounced (Sha-run), long a sound very emphasized, and they didn't want that. So, my first story is about that. During my high school graduation, my name was announced as "ShA-RON (long a, emphasis on RON) Book (like a person would be named book!) Boling" (my maiden name), to which I had to march across the stage and accept my diploma, all while feeling like a professional basketball player and idiot mixed into one. My other story goes back to middle school, where upon arriving on the first day, I realized that Sherron Brook Boling was enrolled as a BOY. Yep, I was in boys' PE and wood-shop. It was suggested that I might consider adding an e to my middle name, which I did, unofficially, on the spot. The counselor took me out of boys' gym, but suggested that I might like wood-shop, especially given the fact that art, music, and drama were full. I stayed in it, and planned and built the best damn ahem...darn Styrofoam house Mr. Murray had ever seen. The boys were amazed. My father, the architect-bashing electrical engineer, was proud. My mother, the interior designer, was impressed. I had a blast! After my dumb stories, kids are warmed up and ready to talk about why they like or don't like their names. Then we make their names for my word wall. I have them already written out in my best "fattie" outlined handwriting, and let them decorate them to represent their personalities for homework that first night. Of course, I weave in the intended purpose of the story, which is kindness and friendship, acceptance of others, and all the rest. 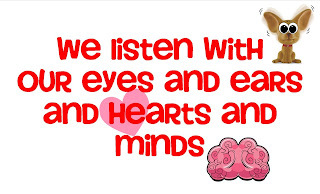 I really do love the story, and even my most reluctant listeners usually do, too, by the end of the lesson! Okay, then, I guess that really is my favorite back to school book. I love telling about my crazy childhood, and letting my students know that I was once a kid, too, and had to go to school, and that people made fun of me, and that, yes, teachers are...humans (GASP again)! Ohhhhh I loved this post! I will have to read Chrysanthemum now on the first day, too! Loved your name stories...to funny! I'm you newest follower! Awww! Anne of Green Gables is my grandma's favorite book! I'm quite sure she never made the "e" connection, though. I love how you use Chrysanthemum, too! OOOhhh! I'll bet! I'd say, "Deer-dra". Is that right? Or is it "Dee-dra"? I have a great friend who shares your name. She's "Dee-dra". I L.O.V.E. Lilly's Plastic Purple Purse and Wemberly Worried, but those might be the only other ones I know. Now I have to Google Kevin Henkes! We use this book at the beginning of the year for writer's workshop but I like how you used and that they get to decorate their names the first week as homework. That's cute! Oh my word! You really do have stories about your name! Bless your heart!! Thanks for hosting, Amanda! Oddly, I ran into the principal of my middle school yesterday. He's the one who suggested the e on my name. He also hired me for my first teaching job, so I owe him quite a lot! I'd love to know more about how you use Chrysanthemum in writer's workshop. Have you posted about that? Totally one of my go to books each school year especially because my daughter is named after a flower...Lily! This is such a great book to use when you are planning getting to know you activities. I actually use a venn diagram on large construction paper so that 2 students can compare the letters in their first and last name. That's so cute, Monica! I almost named Clare Lily, but my mother-in-law pointed out I'd have Callie & Lily and it sounded too much like a flower. 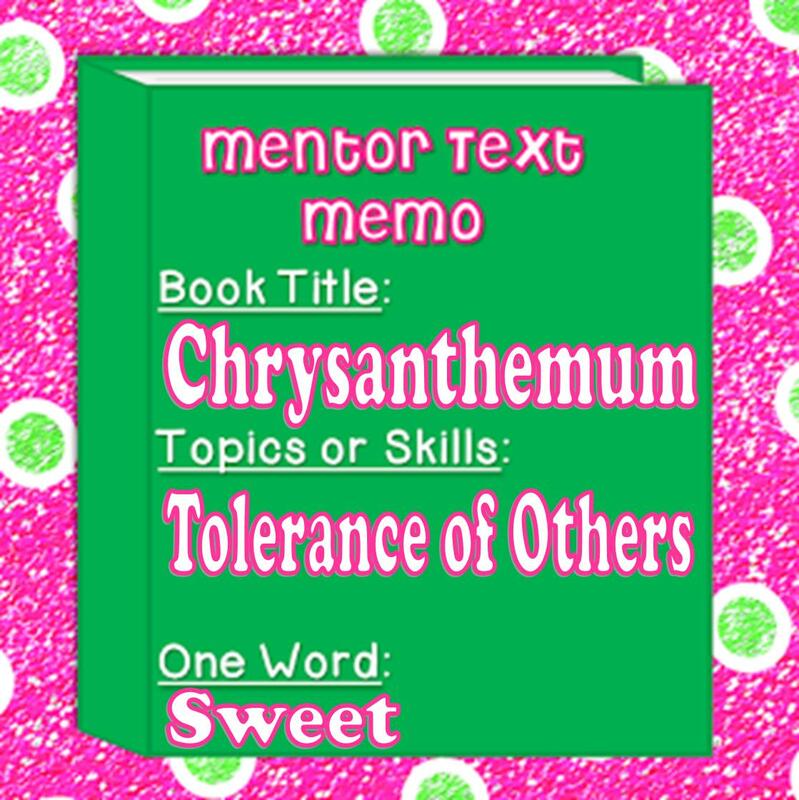 Maybe she needs to read Chrysanthemum, too! Hi Brooke, I just wanted to let you know that I nominated you for the Liebster Award for new bloggers. The details for accepting the nomination are up on my post from today! I'm so happy to have found your through the link-up!